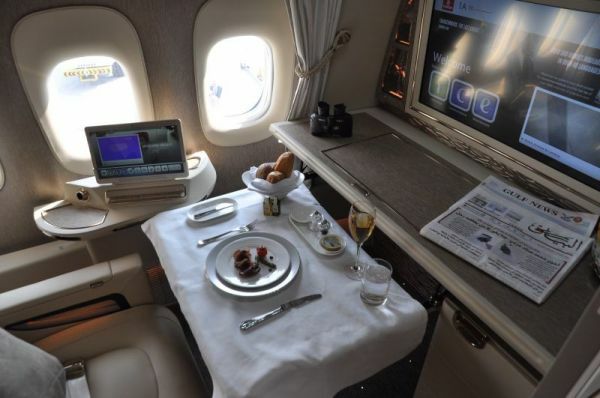 DUBAI - In 2003 Emirates was the first airline offering fully private suites in First Class. Now other carriers are upping the ante and the Dubai-based carrier has to catch up. At the Dubai Air Show this week, Emirates managed to launch a few industry firsts in First – question is: Are they really enhancing the experience? Sir Tim Clark, President of Emirates Airlines, is one of the foremost aviation industry visionaries. He basically helped found Emirates in 1985. And very unusually, Sir Tim is a very hands-on executive when it comes to product enhancements. It was him that basically proved to Airbus over a decade ago that it is indeed possible to install showers in the front of the A380 upper deck. 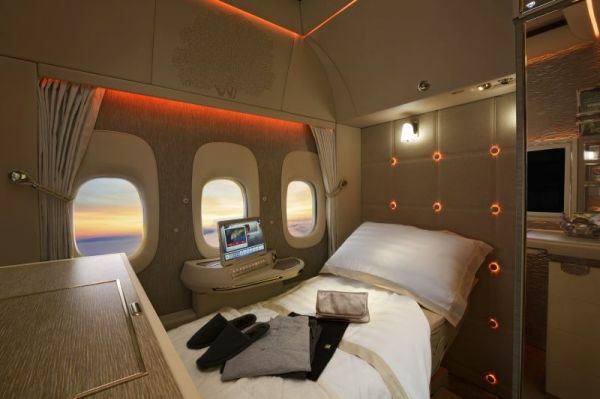 Which have become a big success story in the Emirates A380 First Class product ever since. Now Sir Tim has reached out again to bring the industry some firsts, which becomes ever more difficult in times when most features have been tried already. Since the days of the A380 product design it had been Sir Tim’s vision to offer a fully enclosed First Class compartment to his highest-paying customers, kind of a hotel room. But a decade ago and until recently, aviation safety regulations were against it, crews had to be able to check on passengers. 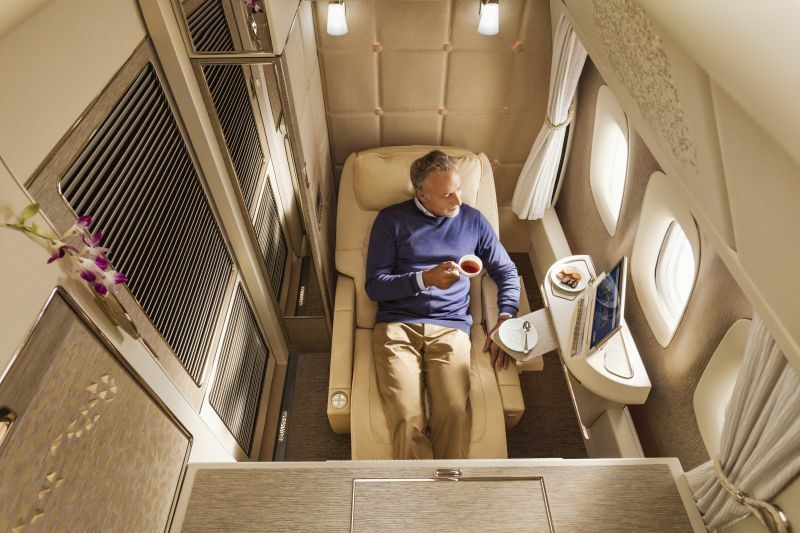 “We started the process in 2013 when we fitted out Emirates’ Executive A319, but still it was impossible then to offer fully enclosed suites, even on a private jet”, he recalls. 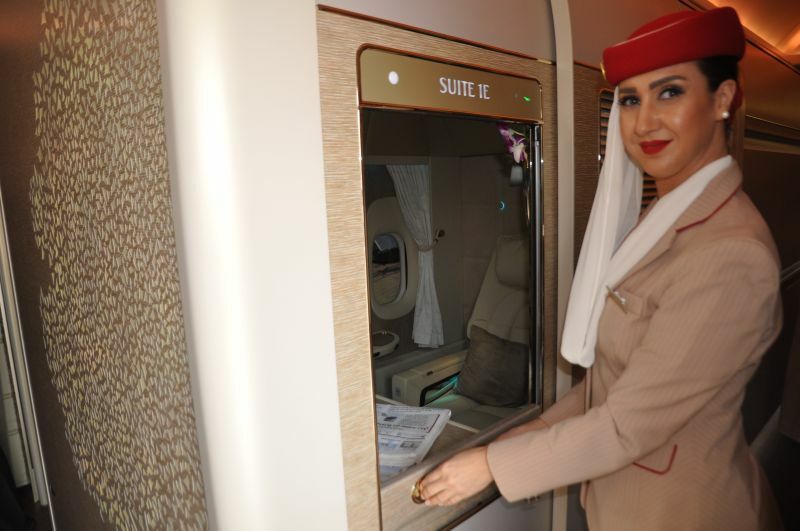 At the current Dubai Air Show Sir Tim was able to unveil the world’s first fully enclosed First Class Suite, initially being introduced on newly delivered Boeing 777-300ERs only. So just don’t get too excited right away – while Emirates flies almost 150 Boeing 777s currently, the world’s biggest fleet of its type, “a maximum of eight to nine aircraft will have the new product by the end of 2019”, admits Sir Tim. Lucky First Class passengers on routes from Dubai to Geneva and Brussels will get the first experience of the new product from December 1. “As we get more aircraft delivered Chicago, Brisbane and Perth are additional destinations likely to get the new product, but we need 2.5 aircraft to serve each of these ultra long haul destinations”, reveals Sir Tim. If existing 777-300ERs wil be retrofitted is not clear as of yet. Current A380s however are earmarked for conversion over a longer period of time, with eleven new Suites replacing 14 older ones. So what is the new product actually like, and which innovations are really making a difference? PaxEx was able to check it out on board of the first Boeing 777-300ER with the new product, freshly delivered from Seattle in time for the Dubai Air Show, registered A6-EQH. Right at the entrance a backlit depiction of the Ghaf tree is welcoming passengers, the national tree of the UAE is the leitmotif of the new product and appears throughout the aircraft. First Class consists of six Suites, compared to eight before, and they come in 1-1-1 configuration, namely 1+2A, 1+2E and 1+2K. The most spectacular ones are, surprisingly, the E-suites in the middle, as they contain a real novelty: Three fake windows on the right side that are showing projections of the outside. “There are two fibre-optic cameras on the outside of seats 1A and 1K, and the passenger in the middle can choose which side he or she wants to see as a video projection in the Suite’s windows”, explains Clark. The passengers in the actual window seats are getting “compensated” with real binoculars of German manufacturer Steiner to peek outside, as part of their Suite’s equipment. The Suites, which are 2,13 meters long and measure up to 3.7 square meters, are now fully enclosed by manually operated, single-piece doors (opposed to two-piece, electrically operated ones so far), reaching up to 2.21 meters height. Another industry first, and a very clever way to both appease regulators and find a unique way of unobtrusive service delivery, is a turndown hatch built into the wall of the Suite. Through the hatch, cabin crew can deliver food or drinks without actually opening the door or disturbing the passenger, and at the same time they can check on the passenger in emergencies. Another industry first is much less of a must-have, it’s indeed a bit bizarre, as experienced airline service trainers complain about the lack of young trainees’ abilities to look a customer straight into the eye as they are so glued to the screens of their gadgets in real life. 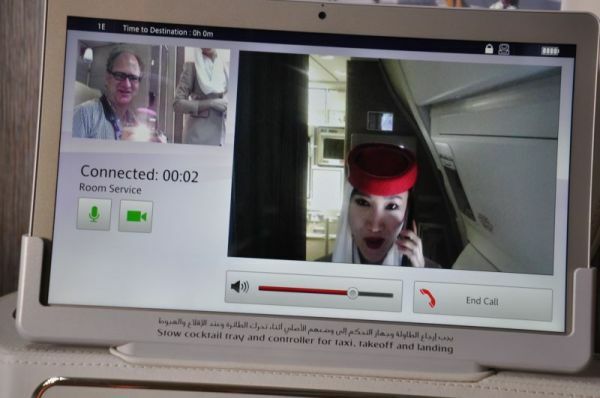 Through a handheld tablet screen in the Suite, that also allows to adjust all other comfort functions of the seat and the Suite, the passenger can opt to do a video room service call into the galley, a mere few meters away, to talk to a flight attendant via a screen to order service of any kind. Just why this is a better way to just talk face to face to a human being standing before you is hard to grasp. There is also an option to just do a voice call to the galley. The Suite is impressive due to its high ceiling, lots of storage options, and its many innovative features, ranging from choosing your personal sequence of mood lighting to individually control your Suite’s temperature. This is a feature that clearly comes from upmarket automobiles, which is a no-brainer as Mercedes was a design partner for the Emirates Suites. While the seat made of finest leather is upright, it is easy to stand up in the Suite, stretch or get changed into the moisturising pyjamas provided. For lounging, Emirates offers a feature called “zero gravity seat setting inspired by NASA technology”. During a brief test on the ground, this didn’t seem to be unusually comfortable, at least not for a large male. The bed length of 78” (1.98 meters) hasn’t changed compared to the current product, only the seat got wider with 30” (76cm). Asked if there had been any incidents so far with passengers becoming too cozy in a Suite, he asserted: “Generally, people behave.” But then, that was before the age of fully enclosed Suites.